A lot of my friends texted me on my B day and I'm touched that they all remembered most especially my college "barkada". 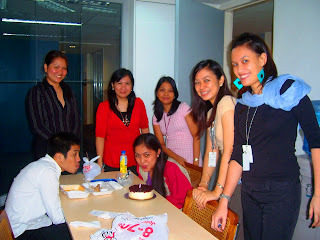 We are 10 in the group and all 9 greeted me thru text and friendster cooments...hehehe. I'm so blessed and happy to have lifetime friends that I can truly keep and cherish. Then yesterday as I report back to work, I got a suprised waiting at my workstation! Waiting for me to be open is a birthday card propped in my keyboard. A print out collage of various pics from my friendster account and assorted balloons inside a Starbucks paper bag with their birthday gift! Yup! My team mates all did this for me . Awwww! So sweet! The surprise is ain't over yet. At lunch time when Oieydie and I are eating our lunch, our PM together with my colleagues gave me a Blueberry Cheesecake from Cheesecake etc. Wow! Ms. Joy - thank you for the cake! I got bloated after eating a slice of it. Rod - thank you for going to Greenbelt in search for a card, balloon and Starbucks mug. Con - thank you for helping Oieydie with the assigned task....hehehe. Aisah - for always sharing her packed food. Thank you for your share for the "surprise". Gi - for making us laugh with her casual-nonchalant-tactful-comments. Thanks for accompanying Rod and Con. THANK YOU EVERYONE FOR MAKING MY BIRTHDAY A VERY SPECIAL ONE. Mwahugs! May God bless you always...!!! Your the 2nd person who wish for me to be a mommy...hehehe! have a tag for you..